Real estate is local. What’s happening nationally is not always what is happening in Denver, CO. You wouldn’t expect sales up in the Colorado Rockies to be the same as what’s going on in the front range. 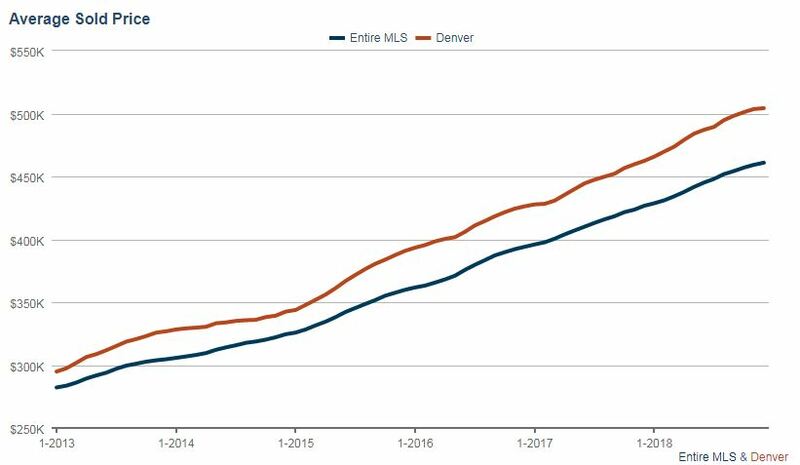 So while the national news does a great job of giving us an overview of the market across the country, it doesn’t always align with the Denver real estate market. I take the local numbers and break them down to help anyone understand the driving forces in the market. Below are the graphs and numbers along with my breakdown of what’s happening in today’s market. Looking at new listings hitting Denver’s market in January, we see that we’re up more than 22% over last year at this time! 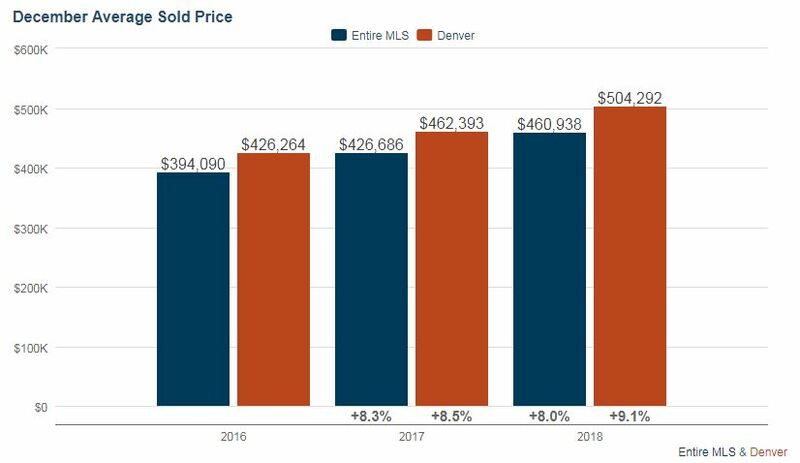 This is a pretty big increase for just Denver county and doubles what we saw come on the market in December. We’ll see this number continue to move up over the coming months, but I’m expecting our total active listings to actually go down in future months as buyers outpace the new listings coming to the market. This is one side of what will drive our appreciation for 2019. While we had 1237 new listings come to the Denver market, we put 1063 listings under contract! Our buyers in January didn’t quite keep up with the pace of new listings. This could be due to the longest government shutdown in American history and the uncertainty that comes with that. Either way, we’ll keep watching these numbers and see if buyers start outpacing the new listings as we expect to happen. Across the entire MLS, we had a couple hundred more new listings than buyers which is basically even when talking about 5,734 homes going under contract. We’re still sitting in an extreme seller’s market. In Denver County, we have only a total of 1,588 homes for sale. That’s an increase of 14.6% over January 2017! But it’s still 1/3 of the homes we need for a balanced market. Our entire Multiple Listing Service gained inventory by over 21% from last year at 9,565 in January but only gained a couple hundred more homes over last month. Most of this 20% increase is due to the expansion of the service area our local Multiple Listing Service now covers. So, here’s one of my favorite numbers to watch – “Months Supply of Homes” or it also works to be called “Homes per Buyer”. In a balanced market, we’ll see 6 months of inventory or 6 homes per real buyer. This gives enough selection for buyers that home values tend to stay flat. Currently we continue to have very few listings for buyers to choose from and our buyer demand is keeping up with the new listings coming on the market. If this doesn’t change, we’ll stay in a seller’s market. Our month’s supply is now sitting at 1.5 months which is 36.4% higher than where we were last year, but only a bit higher than where we were in Denver last month. We’ll want to watch this to see where we stand through in the coming months. While again, this is the highest months of supply we’ve seen since July of 2014, as you can see, we’re still in an extreme Seller’s market. As our supply continues to stay at less than 6 month, we’ll continue to have an upward pressure on prices. If you’re a buyer waiting for homes values to start really going down, we’ll need more than 21,000 more homes to suddenly appear in our MLS OR TRIPLE the number of homes in our market! OR we could also suddenly lose 2/3 of our buyers. With Denver continuing to attract companies and as more people find out the greatness that is Colorado, there is no signs of buyers going away. It’s just too amazing for people to suddenly stop buying here – even if interest rates rise! Reminder, we haven’t seen a 6 month supply of homes in Denver since June of 2011. Low inventory keeps our days on market low. While our average days on market has been sitting at around 30 days, that’s still very low compared to January 2011 where we were at 111 days. And it’s basically no change over the last two years. At Urban Pro Homes, our listing are still selling quickly at about 7 days on average. Compare that to the other agents in the MLS and you’ll see about half of the homes are selling in about 2-3 weeks and half are taking quite a bit longer. As buyers have more selection to choose from, overpriced homes will sit on the market longer. It is crucial that you hire a professional like us to ensure you’re pricing your home right from the start! This number will likely go down in February and March. This also makes NOW the best time to buy, even if you have something to sell or even if you’re “stuck” in a lease. You’re likely to save more on your purchase today with lower interest rates and lower prices than the few extra bucks you might get by selling in the Spring. I’ve been offsetting the cost of breaking a lease for my buyers by taking it off the purchase price and making the seller pay more of your closing costs. If we act quickly, we’ll still be able to beat the other buyers to the market and get you a great deal. Our market is strong. We have started seeing home values move back up already in January and this will continue into February and March. Limited inventory will continue to drive up our prices. Just don’t expect it to be the same as years past. It’ll be similar, but not the same. As my favorite title rep puts it, we’re in a “slightly less great” sellers market. But that’s still pretty great! I foresee us conservatively having 5-8% appreciation in the next year. What will drive an inevitable slow-down? Interest rates going up will make purchasing a home even more expensive in Denver. As home values continue to rise and wages continue to stagnate, home affordability will continue its downward trend meaning fewer buyers can afford to be in the market. Job growth is bringing well-paid professionals to Denver who can afford our city. We get lots of buyers from California and New York who think our prices are a steal!! Everyone from Texas thinks our property taxes are amazing! We still have too few homes available for the buyers wanting to buy. Meaning, we will continue to set new records for our average sales price. So, until people leave Denver or we build significantly more housing, we will continue to stay in a seller’s market. As the market adjusts, Urban Pro Homes will be watching to ensure our clients get the best! We’re already diving into our compression phase of the year. Home values are pushing up again and there’s competition in the right price points. However, there’s still time to get a great deal on your purchase. The FED rose rates in December. While they left the rates the same at their last meeting, that doesn’t mean we won’t see interest rates go up this year. Buying today locks your rate and keeps your payment affordable. Waiting to buy is hurting you. Prices are more than 8% higher than a year ago. Waiting another year will mean another 8%. And that’s not including interest rate hikes! It would have been great to buy last year! But like the adage goes, the best time to plant a tree is 30 years ago; the second best time is today. The numbers are showing this to be another “Higher, Faster, Sooner” year of appreciation. So, the quicker you act, the better off you’ll be financially.